Many locals of Main Brook, Newfoundland in Canada love to spend their summers fly fishing in Trout River where serenity and wilderness surround them. River fly fishing is also enjoyed by many visitors that stay at the Tuckamore Lodge in Newfoundland as the Trout River is close by this first class resort. Fly fishing, Main Brook, trout river, Newfoundland, Canada, North America. Model Released. 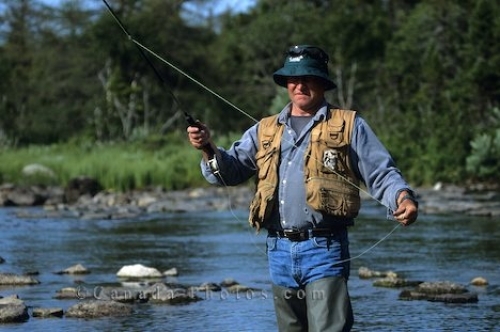 Picture of a man fly fishing in the Trout River in Main Brook, Newfoundland in Canada.